The Nebula Awards are one of the great institutions in science fiction and fantasy. Each year since 1965, the members of the Science Fiction and Fantasy Writers of America (SFWA) have voted for the Best Novel, Novella (40,000-17,500 words), Novelette (17,500-7,500 words), and Short Story (less than 7,500 words) in SF and fantasy. Compiling a list of the nominees and winners for all those years would get you an excellent reading list and a comprehensive cross-view of the best that can be found in the genres. To make this task easier, every Nebula Award since the first one has had a corresponding book that collected some of the stories, ballots and related texts. The Nebula Awards Showcase 2011, edited by Kevin J. Anderson, is the first one of these to be released by Tor. First thing to be aware of, and just to avoid any possible confusion for people who may be new to this particular format: the annual Showcase is timed to be released around the following year’s Nebula Awards ceremony. This means that this specific book, The Nebula Awards Showcase 2011, presents the winners and nominees from the 2010 Nebula ballot, which in turn means that it contains stories that were all originally published in 2009. Taking a look at the Table of Contents for this anthology, it’s hard not to feel that this book offers truly excellent value for your money: it contains every single nominated short story and novelette on the final 2010 ballot, as well as the winning novella in its entirety. There are also short features about, and sample stories by, the 2010 SFWA Author Emeritus (Neal Barrett, Jr.) and the 2010 SFWA Grand Master (Joe Haldeman), and the winning poems in the three Rhysling Award categories for SFF poetry. There’s no excerpt from the winning novel, but as it is, the book still offers up a lot of great science fiction and fantasy in one affordable volume. In the short story section, you’ll find stories by Saladin Ahmed, Michael A. Burstein, N.K. Jemisin, James Patrick Kelly, Will McIntosh and (winner) Kij Johnson. My favorites among the nominated stories are Will McIntosh’s “Bridesicle,” which applies the concept of the “mail order bride” to cryogenic storage in a chilling and touching way, and James Patrick Kelly’s “Going Deep,” a subtle story about a disgruntled teenager growing up alone without her spacer mother. Both of these are gorgeous, memorable stories that hint at much more than they explicitly describe — the kind of story you could imagine building a novel around. The Nebula went to Kij Johnson’s “Spar,” a shocking and original story that challenges the boundaries of comfort. “Spar” was originally published in Clarkesworld Magazine. The novelette section contains entries by Paolo Bacigalupi, Michael Bishop, Richard Bowes, Ted Kosmatka, Rachel Swirsky, and (winner) Eugie Foster. Unlike the short story section, which contained a few stories I personally wasn’t wild about, each of the included novelettes is nothing less than excellent, making it hard to pick a favorite. The winning novelette, Eugie Foster’s “Sinner, Baker, Fabulist, Priest; Red Mask, Blue Mask, Gentleman, Beast,” won the Nebula and was originally published in Interzone. It’s a brilliant piece of fiction, but my personal favorite here was still Paolo Bacigalupi’s “The Gambler,” offering a realistic look at what the news media is even now turning into. Also gorgeous is Ted Kosmatka’s “Divining Light,” which combines a very hard SF concept with very human emotion in a way that’s reminiscent of that other brilliant short fiction writer called Ted. Ah hell, all the nominated novelettes are great — just read them all. Closing out the prose material from the 2010 ballot is Kage Baker’s “The Women of Nell Gwynne’s,” which won the award for Best Novella. This story is connected to the author’s acclaimed Company series, set in the same period as her novel Not Less Than Gods, which also mentions some of its characters. I highly recommend it to everyone who loved the Companyseries. “The Women of Nell Gwynne’s” was originally published by Subterranean Press. Aside from all this excellent prose found on the 2010 Nebula ballot, The Nebula Awards Showcase 2011 contains a few tasty extras. There’s “Getting Dark,” a truly stunning story from SFWA Author Emeritus Neal Barrett, Jr., and “A !Tangled Web”, a hilarious story by SFWA Grand Master Joe Haldeman that may surprise people who only know the author from his classic SF novel The Forever War. There’s also a transcript of the funny and touching speech Connie Willis gave about/to Joe Haldeman during the award ceremony. The book also contains the three lovely Rhysling Award-winning poems, one by Amal El-Mohtar and two by Geoffrey A. Landis. Finally, each short story and novelette is preceded by a short introduction by the author and followed by a brief, informative author bio. Sadly, Kage Baker passed away in 2010, so for “The Women of Nell Gwynne’s” there’s instead a brief, touching essay by her sister, Kathleen Bartholomew. 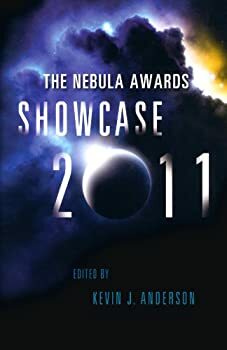 The Nebula Awards Showcase 2011 offers a wonderful and generous sample of the best SFF has to offer. It’s a great snapshot of the genre, presented in a wonderful format and at a very reasonable price. I’m already looking forward to next year’s installment! One week later, I’m here to report that I cannot get the winning story “Spar” by Kij Johnson out of my head, so I feel like maybe I short-changed it in the review. My goodness, that story is disturbing.